I have increasingly noticed over the past few years that many people (some of whom I thought would know better) seem to have a hard time coming to terms with the issue of young people with SEN having the mental capacity and ability to make decisions about their own lives. Please do not get me wrong, mental capacity has always been a major cause for concern where young people with SEN are the subject, but the law states clearly that there is always an assumption of capacity for them, unless all practical steps have been taken to help them, without success. Importantly, there is also a difference between someone having no capacity and them making unwise decisions. In essence, if someone is deemed to have capacity, they have the legal right to make a decision, even if you or I think that they are making the wrong choice. For example, just because a young person with SEN makes a decision, which their parents or others may not have made, this does not automatically mean that they lack capacity. 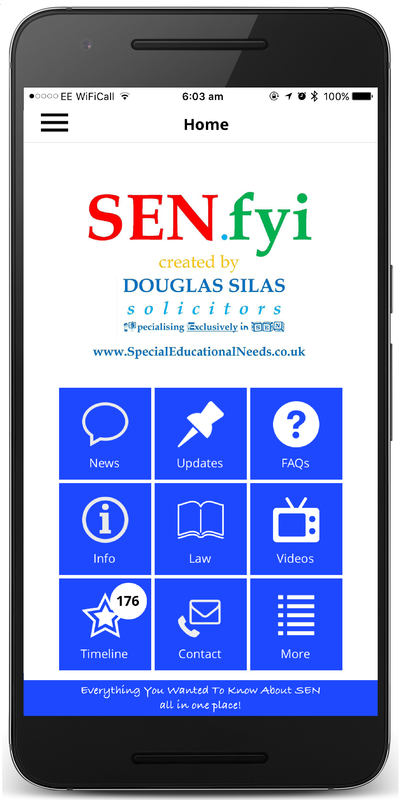 Obviously, in some situations, a young person with SEN (perhaps with Severe Learning Difficulties) may not have capacity, but in other cases, it may not be so clear-cut. This was very much brought home to me recently, when I attended a workshop on mental capacity run by the Council for Disabled Children (CDC) at the end of January 2017 (more about which I refer to below). The person running the workshop pointed out to us that mental capacity also means having the ability to make a single decision at a single time. She also said that time constraints in life when growing up can sometimes mean that young people with SEN may not have had the same experiences of making decisions as other young people, even simple decisions such as what to wear, what to eat, etc. It was highlighted to us that even simple everyday decisions that we need to take can sometimes actually be quite complex when they are broken down into their component parts or steps; and our decisions are usually based on past experiences of what works/does not work, including any mistakes that we have made, but that we have been able to learn from. She stressed that we should presume that everyone can make their own decisions, unless it is proved otherwise. Young people with SEN are not to be judged as incapable of making a decision unless all practical steps have been taken to help them to do so, without success. Finally, it was said that when it comes to deciding whether or not someone has capacity, it is really a functional test on how a decision is made. The focus should not be on the consequences of that decision. One thing I gained from the workshop that really struck home for me was an understanding that we should give young people with SEN the chance to build up their resilience in life, by allowing them to take risks and make mistakes sometimes. This was also brilliantly demonstrated to us through the session also being an interactive one, where role play was used with the assistance of a drama group, which included a young person with SEN and her mother (who did not have SEN). I would highly encourage people to see this workshop for themselves if they get the chance; I believe it is a workshop that is also given around the country by CDC. Even though I have experience professionally of dealing with capacity issues, it was very interesting for me to see things from a different perspective. I was so taken by this that when I came home that evening, over dinner, I discussed the capacity issue with my 18 year old daughter, Tali (who does not have SEN). All of my three children (or should I say young people now) are in their late teens currently. I explained to Tali in detail the scenario that had been demonstrated to us by the drama group, where an 18 year old young woman with SEN had wanted to do a particular course of study at college that was different to the one that her mother wanted her to do (she wanted to do a course on hairdressing, but her mother wanted her to do business studies). The young woman also wanted to go to a party that weekend with her 17 year old sister (who did not have SEN) and get drunk. Although her mother was dead set against both ideas for her at first, but did not seem too perturbed about her sister going out and getting drunk (remember the sister was still under 18, but the young woman with SEN was already 18). It was only when the dispute between the mother and the daughter was mediated by a third party that the young woman with SEN clearly demonstrated to her mother that she had actually carefully thought out all of the implications of both decisions and how to deal with them (e.g. wanting to do a job which she enjoyed and also the fact that she would know that she could suffer through drinking, had made arrangements to get home, etc). We eventually saw her mother come round and accept she should allow her to do these things - she even reminded herself that she was also young once! But I was then very surprised when my daughter (remember, although I have been advocating for children and young people’s rights for many years, to my children I am just a ‘grumpy old dad’!) said that the mother was right to try and impose her will on her daughter as she had SEN and was therefore vulnerable, even though I pointed out that the young woman with SEN was already 18 (the same age as my daughter) and stressed that, objectively, she did seem to have the capacity to make her own decisions, even if they seemed mistaken. It is very interesting when tables seem to be turned like this and it is actually your own teenage daughter who seems to be more overprotective towards a young person with SEN than you are. ​I had to stress a number of times the fact that it was only by being allowed to make these decisions that a young person (even with SEN) would be able to build up resilience and be able to learn from their own mistakes. I even pointed out that by effectively ‘wrapping her up in cotton wool’, we could be actually doing the young woman with SEN a disservice in the long run. There is probably not very much more for me to say about this issue, but I believe it is important for me to raise it here with you, as I feel it is quite thought-provoking. I would also just say that it may be very interesting if, during the next few days or weeks, you have this same kind of conversation with various family members (especially teenage children) and/or friends or colleagues, to see what their responses are. Remember, it is a right to be wrong sometimes.